Long narrow strip used to publicize an upcoming exhibition. Long narrow strip used to publicize an exhibition being presented by the museum. Room reserved for museum staff; it houses technical documentation related to the museum’s activities. Large space that provides access to other rooms in the museum. Room where items for sale are displayed. Room equipped with monitors so staff members can watch over a museum’s various rooms. 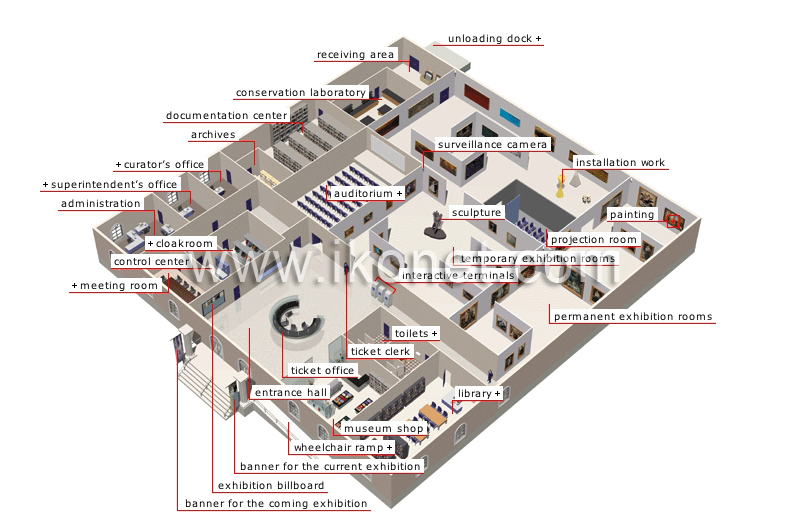 Place where tasks related to the management of museum services are carried out. Superintendent: person who oversees the various museum services. Curator: person who administers and is responsible for a museum’s collections. Instrument that transmits an image of a room to the control center; it protects against theft and vandalism. Three-dimensional artwork composed of elements arranged in a precise order, in keeping with the artist’s intention. Artwork created from a material, which is worked to depict a given form. Pictorial work usually executed on a canvas, which is stretched and then framed. Room designed for the maintenance and restoration of artwork. Area designed to receive artwork. Facility for off-loading crates containing exhibition equipment. Interactive computers with touch screens or keyboards that, with the visitor’s participation, provide a variety of information. Room occasionally used to present audiovisual materials related to the exhibition’s artist or theme. Rooms designed to house short-term exhibitions of a given artist or theme. Rooms where the museum mounts long-term showings of the works in its collection. Room designed to satisfy basic needs and equipped with sinks.